I rediscovered public libraries when I was 24 years old. That’s a pretty weird sentiment, given what a central place libraries often hold in people’s lives. Drop by any Saturday morning and you’ll find parents shuffling their kids around, senior citizens leisurely reading large-print editions, students clustered around tables in silence or sneaky whispers. How do you miss something like the public library for twenty years? The answer is complicated. In truth, libraries have been a very big part of my life. As a frequent patron of my middle school library, I submitted requests to the librarian for new reads. I worked in the archives at my undergraduate library and went to the University of Illinois Urbana-Champaign, which houses the second largest university library collection in the United States, for my master’s. I’ve spent many an hour roaming the stacks and shuffling texts on a table, and yes, I’ve been known to hog a printer or copy machine on occasion. The issue was that my hometown public library was rarely at the center of my life. There were times my parents would take me there to do a school project or grab a small armful of picture books, but more often than not, we were a bookstore family. My dad is an especially avid collector of volumes and so, from the time I started getting an allowance, I was shopping at Borders (RIP) and Barnes & Noble. My shelf space was, and still very much is, overflowing with tomes thick and thin, absurd and serious. It is, of course, nothing compared to my dad’s, who has his own home library, with floor to ceiling shelves and the rolling staircase right out of Beauty and the Beast. Well, like I said, I attended U of I, where one was never in want of a library. The campus is littered with buildings big and small, and it even has a system that allows books to be transferred between libraries all across the state. But even a library that expansive can’t have everything, and when I was desperate to read some new release, one of the librarians suggested I check out one of the two public libraries in town. That’s right, the area has two public libraries—and what a blessing that was. Laying my eyes on the Champaign Public Library was like looking at a work of art. Built in the modernist style, the lines are sleek and sharp, the windows wrapping around the second floor warming up the whole space. Electrical outlets at every table, comfy couches and armchairs everywhere, and a café on the first floor for when one’s attention wanes after long hours of study. It was love at first library card. While I spent the majority of my study time at the Champaign library, the Urbana Free Library had its own charm. With a building done in the classical style of stone and pillars, one gets the distinct impression that one is in a place of mystery and history, of time gone but not forgotten. Worn-out leather seats, classic windows, and heavy wood tables all added to the feeling of being in a place of import and learning. It also has a café—’cause graduate students have their priorities. But a master’s is earned in two short years, and I wound up back in my hometown to figure out the rest of my life. In search of meaning and meaningful employment, I took any chance to get out of the house. And if filling out applications at my local public library was that chance, I leapt at it, even if my school day memories of the place were of how old and boring it was. But soon I was back in the natural rhythms I had developed while away—talking to the librarians about new releases, renewing my library card, getting on the system to make sure I could read all the comics and novels I’d been missing. Now, there’s not a month where I’m not carting several volumes in and out of those doors, which I had so wholly ignored before. Here’s the truth: There are many ways to love a library. You can love it for the space it provides you to work. You can love it for its ability to get you any book you’ve been dying to read. You can love it for the services it provides for your communities, even if you don’t really need them. You can love it through donations and volunteer work and voting for better funding. 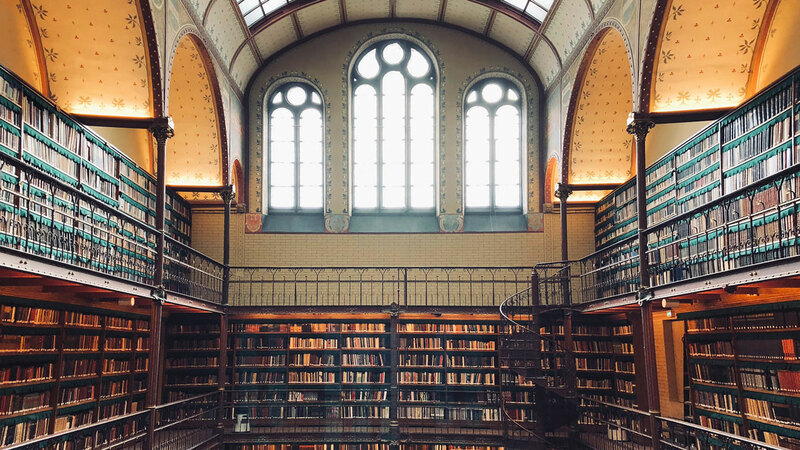 This National Library Week, I encourage you to go back, look at the libraries you might have left behind or unexplored, look into the great works they’re ready to share, and get to know the stellar people who work at them. It’s never too late to rediscover what’s always been right in your own backyard.